You can designate anyone as a beneficiary and distribute your assets in any way you like, however if you don't provide for your family and dependents, your will can be contested and your hard won assets used on litigation fees. You also should consider the effects that an inheritance may have on your beneficiaries. In some cases a testamentary trust can sidestep potential taxation problems, so it's important that you get specific advice about your situation. 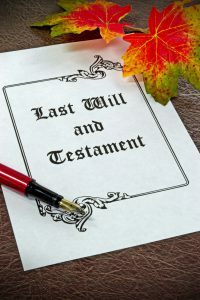 To be valid, the person making the Will must be mentally competent, the Will must be correctly signed and witnessed, and show no evidence of tampering. The witnesses to the Will cannot be beneficiaries, or related to beneficiaries and must be over 18. If there is any doubt, or potential for dispute as to your mental competence, you should get a doctor's confirmation of your capacity to make the will and include it with your Will. We know the potential pitfalls, and will ask you all the right questions to make sure that you have considered every possibility. We can advise you as to whether you would be best with a Will or a Testamentary Trust. We can design your Will in such a way to help protect your family from expensive estate litigation after your death and we can safely store your Will in our secure vault. Contact us to discuss your particular situation and your family's needs with an experienced will solicitor. Our professional charges for make a standard will is £150.00+VAT for each will.